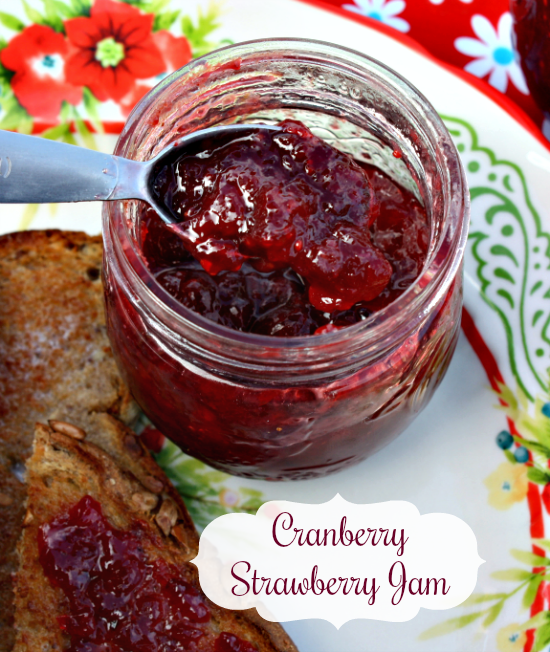 A festive holiday jam perfectly sweet with a touch of tartness from fresh cranberries and frozen strawberries. 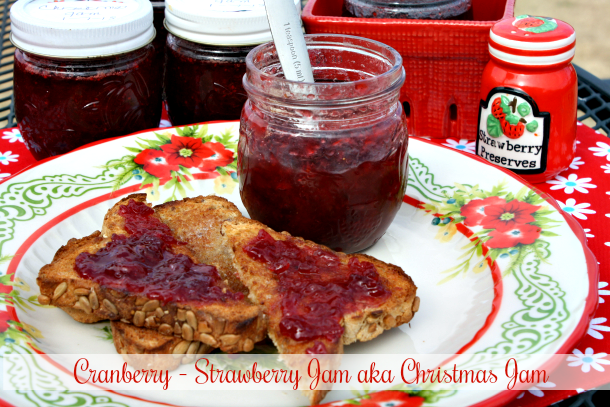 I know it seems odd to post a Christmas recipe at the end of February, but this jam recipe is too good not to share. 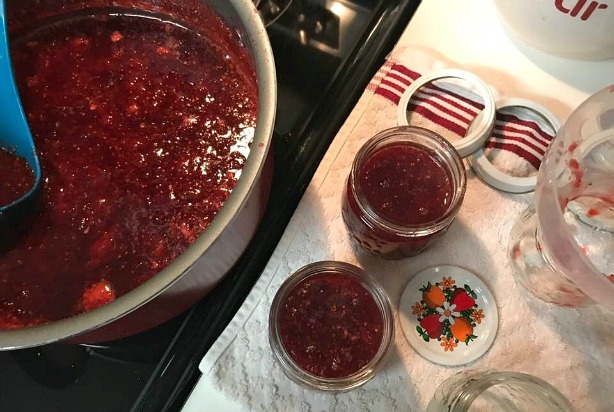 I made this jam back in January and I'm just now getting around to posting the recipe. I was sick the entire month of December with bronchitis, so I wasn't able to do too much of anything. All I could do was rest, so everything else was pretty much put on hold. No holiday shopping, no cooking, no baking or candy making. When I finally felt back to myself Christmas came and went. Even though Christmas was over I did manage to bake up a few holiday sweets and treats for my family. I ❤ canning homemade jams, jellies, fruit butters and preserves. 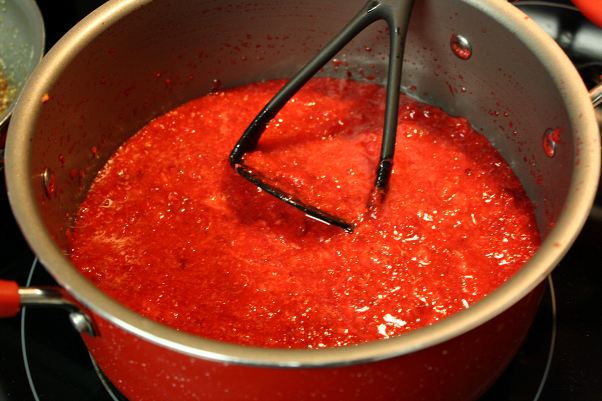 Strawberry Jam is my family's favorite, but this Cranberry - Strawberry Jam aka Christmas Jam comes in a close second. If you've not familiar with Christmas Jam it's a sweet-tart jam packed full of fresh cranberries, strawberries, oranges and spices. This jam is simple to make and perfect for canning so you can enjoy the flavors throughout the year. 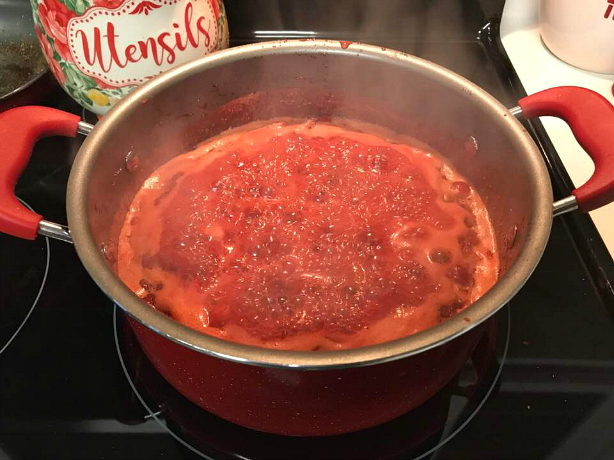 I was lucky enough to have a few bags of cranberries in my freezer so I was able to make this Christmas jam after the holidays. Maybe you have some cranberries stored in your freezer? If so, you definitely need to make this jam. These are the ingredients you'll need: fresh cranberries, frozen strawberries, one orange, cane sugar or (granulated sugar), water, cinnamon and liquid fruit pectin (not pictured). Combine cranberries and sections of seeded orange in a food processor. Pulse until coarsely chopped. Add the chopped cranberries, strawberries, orange zest and cinnamon to a large pot. Using a potato masher, mash the fruit mixture as best as you can. Add sugar and water, mix until blended. Cook for 2 minutes over low heat, stirring constantly. Increase heat to med-high and bring the mixture to a full rolling boil. Stir in the pectin and stir again. Return the mixture to a rolling boil, reduce heat and simmer until the mixture reaches 320 degrees on a thermometer (be patient). Immediately ladle the mixture into sterilized half pint mason jars. Wipe the rims of the jars with a damp cloth. Place lids on jars and screw the bands on just until snug. 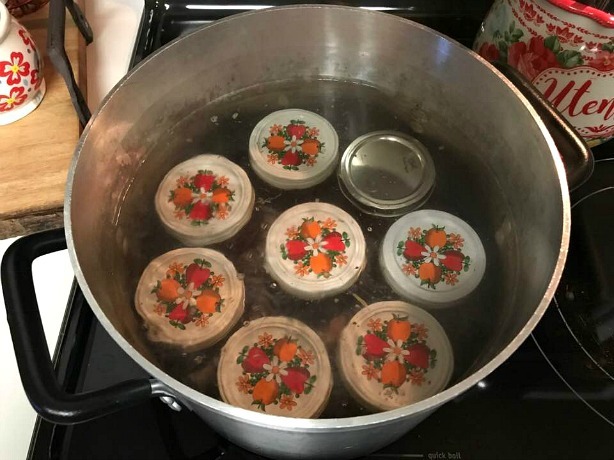 Place the filled jars into a hot water bath canner (making sure the water covers the jars) and process the jars in a boiling water bath for 10 minutes. Remove jars and cool on a towel on the counter. Listen for the jars to pop and check to make sure all the jars have sealed by pressing down on the lid of the jar. Store jars in cool dry place for up to 6 months. Wash jars, lids and rings. Fill jars about 2/3 full of water and place in a water bath canner. Fill with water and place on stove top over med-high heat to sterilize jars. 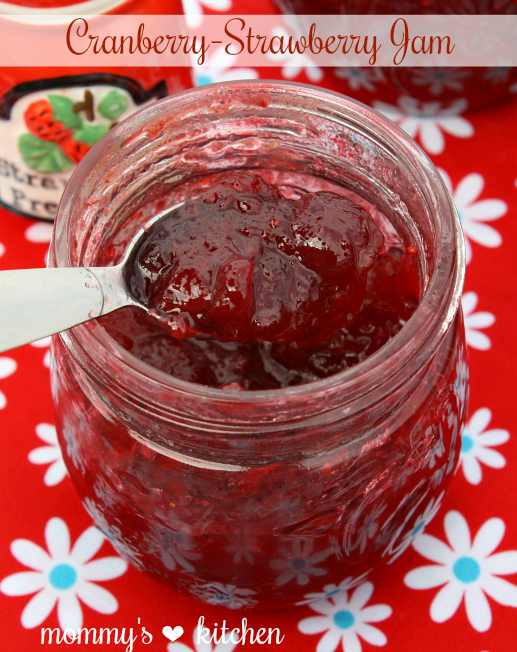 Place the lids in a small pot or bowl and cover with boiling water while you prepare the jam. Combine cranberries and sections of seeded orange in a food processor. Pulse until coarsely chopped. 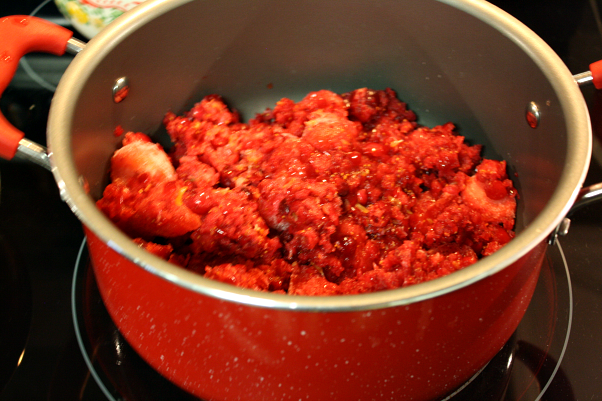 Add the chopped cranberries, frozen strawberries, orange zest and cinnamon to a large pot. Using a potato masher, mash the mixture as best as you can. Increase heat to med-high and bring the mixture to a full rolling boil. Stir in the pectin and stir to mix. Return the mixture to a rolling boil, reduce heat to a low simmer. 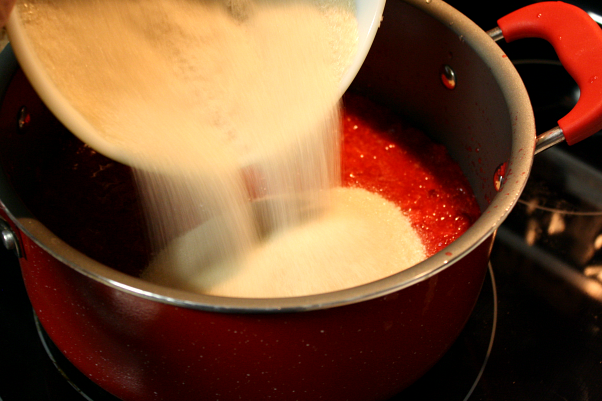 Simmer the jam mixture until it reaches 320 degrees on a thermometer (be patient). Immediately ladle the mixture into hot sterilized half pint mason jars. Wipe the rims of the jars with a damp cloth. Place lids on jars and screw the bands on just until snug. Place the filled jars into a hot water bath canner (making sure the water covers the jars) and process the jars for 10 minutes. Remove jars and cool on a towel on the counter. Listen for the jars to pop and check to make sure all the jars have sealed by pressing down on the lid of the jar. Store jars in cool dry place for up to 1 year. I had every intention of making this last Christmas but just never got the job done, so my packages of cranberries are still in the freezer. Hoping to get this made before gardening season begins. (personal note) I know we needed rain but it can stop anytime now as it has been raining non stop since Sat and according to forecast; have showers through next Wed. Our back yard is one muddy mess due to the fact we had to have new septic system put in. Take care Tina and enjoy your week and have a wonderful weekend. Thanks 4 this jam recipe. This jam looks so great! Thank you for the recipe! Gotta spend this weekend to try it.